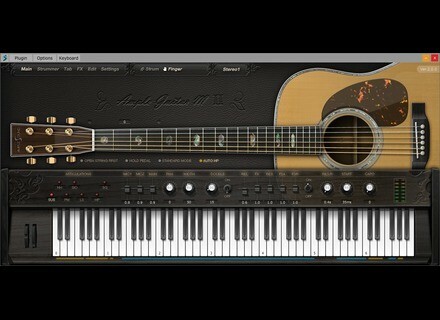 Ample Guitar M II, Virtual acoustic guitar from Ample Sound in the Ample Guitar series. Product replaced by the Ample Sound Ample Guitar M III. Pro Tools users can now go to Ample Sound website and get the virtual guitar RTAS plug-ins. Ample Sound has ported its four Model M, P, F and G virtual guitar plug-ins to the Pro Tools platform. The guitars reproduce Martin acoustic model as well as PRS, Stratocaster and Les Paul electric instruments. Ample Sound will also release an AAX version of its plug-ins in the future. You can download the RTAS version from www.amplesound.net. Friday's Freeware: a rack for guitar and bass Before rushing to the garden to search for Easter eggs, have a look at Plektron's front yard, the 2nd version of its Guitar Amp rack is ready. Loopseque iOS app updated to v2.7 Casual Underground has updated its Loopseque Mini loop sequencer app for iPhone and iPod Touch to version 2.7.